Normally, I never do two postings in one day, but I wanted to get this out to everyone before the 4th of July. There’s still time to make this for your celebrations; and if not for this year, then make it for next year. 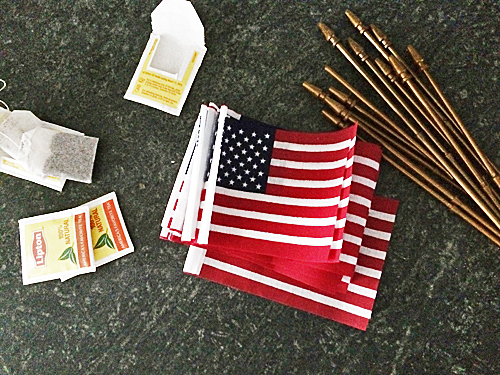 After dyeing the flags and letting them dry, I cut the ends off that were slipped onto the plastic sticks. 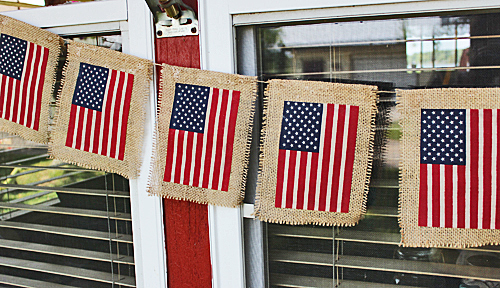 I also cut my burlap a bit wider and longer than the flags, with enough to fold the top over to hold the twine for hanging. Then I ironed everything, including the 1 inch under at the top. I had read somewhere about spraying starch on the burlap to prevent it from unraveling, and for only $1.77 at Target, I thought it wouldn’t hurt to try this. 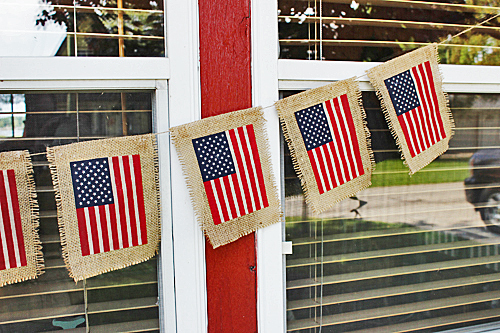 On a side note, please note that these flags are only 4×6 inches, are considered disposable and were sold in the section of the store where they sold decorations for parties. These are flags that kids might play with. Also note that if you’re hanging the flag vertically, such as above with my banner, the stars should be to the observers left. My father served in WWII and was buried at Arlington with full military honor, my husband served and our son recently retired after 20 years with the army, so we are a very patriotic family and follow protocol for the American flag. To see where I’ve linked up and I’m partying with, click here. Oh my goodness, this is so pretty! I never would have guessed that it was a last-minute craft. I love it and I think I'll make one for my back deck. Thanks so much for sharing at Inspiration Thursday. Have a great week! I am a huge fan of burlap! This looks really great hanging across the cottage windows. 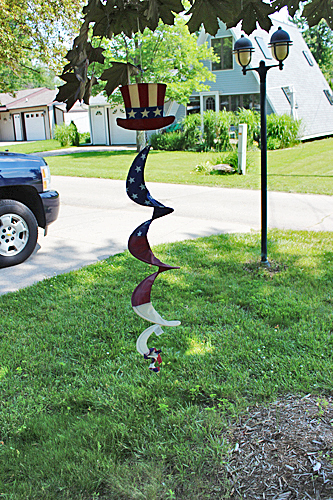 I love the Fourth of July, I don't have any decorations, but this is perfect! I may have to whip one up. If not for this year then for next, I'm pinning so I can find this again. Love it! This really is a very easy and inexpensive project, Nikki. Hopefully you can make something like it, some day! Thanks for stopping by and I hope you have a great rest of the week. 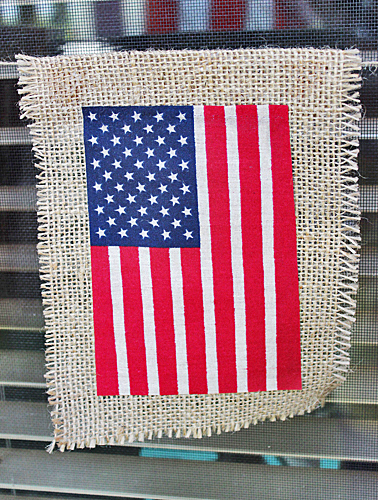 Carol your burlap flag banner looks great hang on your red cottage. Looks like your all set for the 4th of July. How did the starch work for keeping the burlap from unraveling? What a wonderful patriotic banner! Thank you for the thorough tutorial. And thank you for joining us at TOHOT. This will look great on my back porch. 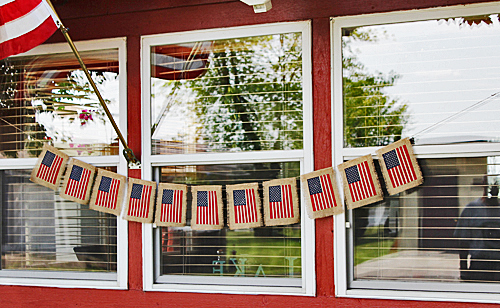 I don't have a lot of 4th of July decorations but I'm adding just a bit every year. 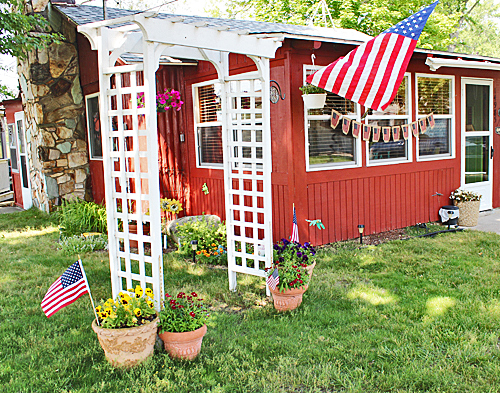 It really looks very nice on your cottage! This is so cute and I love how easy it looks too! Thanks for linking it up at Talk of the Town - I pinned it to the Knick of Time party board! I love love love this little banner! So fun and festive! Thank you so much for sharing at Your Inspired Design. 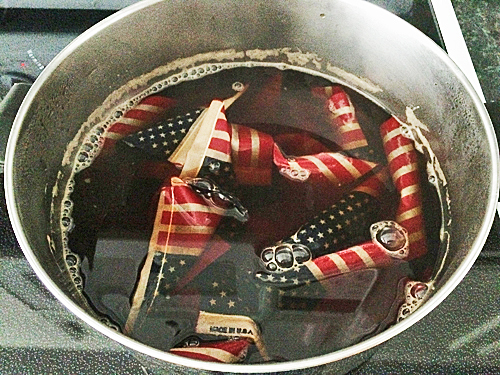 I pretty sure when back when I was an Eagle Scout they told us to never soak the American Flag in tea. Wow, looking at this picture took me by surprise, as it looks like my grandparent's home! They were very patriotic as well and would have loved this! It was quite shocking! In a nice way! No, the farm country of Southern New Jersey. I wish I could find a picture! 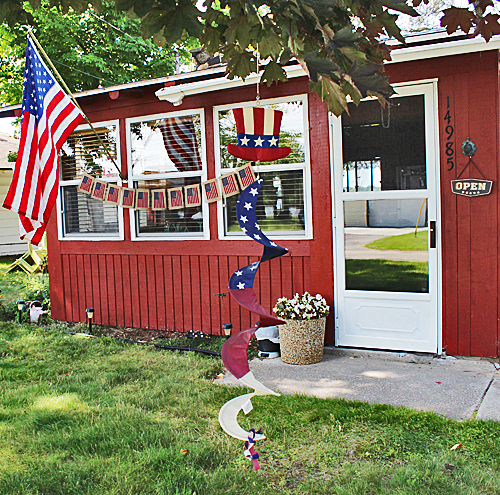 Carol, your banner looks so cute on your red cottage! 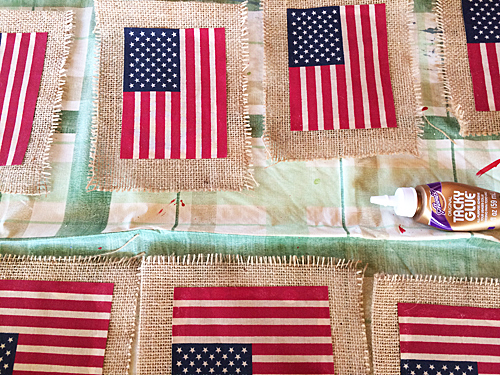 Love that you tea stained the flags, too--pinned! Thanks for sharing at Vintage Charm! I love this! The tea dying technique is a great idea. What a festive look for the 4th of July. Pinned. Thanks for partying with us!